Lior Mizrahi/Getty ImagesA view of the Western Wall and the golden Dome of the Rock Islamic shrine on December 6, 2017 in Jerusalem, Israel. U.S. President Donald Trump will announce his recognition of Jerusalem as Israel’s capital on Wednesday. President Donald Trump made two big announcements on changing the US position on Jerusalem as Israel’s capital. Trump also made clear that one of the most important aspect of US policy on the future of Jerusalem will remain the same. The US is not taking any position on how the city should be divided between Israel and Palestine. President Donald Trump announced that he would be moving the American embassy from Tel Aviv to Jerusalem and recognising the holy city as the capital of Israel on Wednesday, changing a position the US has held on the city’s status for decades. The president also made clear that one of the most important aspect of US policy on the future of Jerusalem will remain the same, as it has under previous administrations. In his announcement, Trump noted that despite the change in America’s official position on Jerusalem’s status, the US is not taking any position on how the city should be divided between Israel and Palestine. Notably, Trump did not say the phrase “united Jerusalem” in his speech, which may have been an acknowledgement of the separate East and West parts of the city. 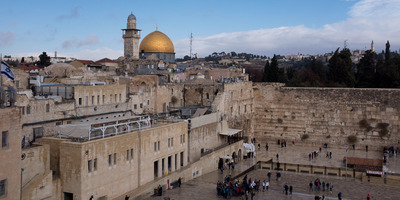 Jerusalem is currently divided between East and West – West Jerusalem has been part of Israel since 1948, while East Jerusalem, which includes the historic Old City, was captured from Jordan in 1967. East Jerusalem is legally considered to be under occupation by Israel, just like the Palestinian-majority West Bank. While Israel considers Jerusalem in its entirety to be its capital, Palestinians see East Jerusalem as the site of their future state. A final status agreement of the city has long been considered to be determined by negotiations. By stressing that the issue of the city’s division between Israel and Palestine remains up for negotiation between the two parties the US will remain committed to its policy of resolving Jerusalem’s divisions according to the result of future negotiations. Recognition of Jerusalem, coupled with the embassy move, would be consistent with the stated wishes of Israeli Prime Minister Benjamin Netanyahu. The change now makes the US the only country with an embassy in the contested holy city. The optics of this are likely to drive unrest throughout the region, and Trump may yet face political consequences for the move.